Displayed in its eighteen rooms on two floors, some shaded and intimate, other high ceilinged and ablazed with the Mediterranean light that so enraptured Matisse, the permanent collection is a celebration of Matisse's life and work. A stroll through the museum will allow the visitor to discover Matisse's mastery of different mediums and techniques with works from every period of his life thus revealing the evolution in Matisse's art. The exhibition "Matisse and Antiquity" is aimed at highlighting the links uniting Matisse with Antiquityís arts, particularly by recalling antique statuary, academicism, the technical source of artistic expression, and Hellenic mythology which relates the encounter of Gods and humans through its art. Around 80 works of different periods will enable us to establish links in time, to draw comparisons which will give an inkling of bases and methods of Matisseís aestheticism. 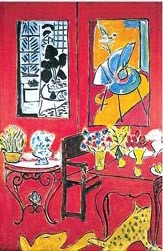 When Matisse was questioned by Guillaume Apollinaire, then a journalist for "La Phalange", in December 1907, he stated about his inner world and artistic sensitivities: "I have striven to develop this personality by relying mainly on my instinct and often coming back to principles". Matisse was aware that his work was evolving compared to the artistic movement of that time, his pictorial perception was changing and a new way was opening to him, respecting the teaching of the Masters he had emotionally chosen. So he endeavoured to go to the Louvre in order to copy "Classics"ís canvases and to become carnally imbued with antique sculptural shapes. 10 a.m. to 5 p.m. from October 1st to March 31st. In languages other than French. Guides tours are available with fully qualified local guides.